The truck driver suspected of mowing people down on a riverfront bike path near the World Trade Center, killing eight people and injuring a dozen others, was charged in federal court Wednesday evening. Sayfullo Habibullaevic Saipov, 29, entered federal court in a wheelchair, handcuffed and with feet shackled, to face terrorism charges. He did not enter a plea. He used headphones to listen to a Russian translation of court proceedings, but answered the judge in English, saying, "Thanks." His attorney David Patton said they were not seeking bail. A judge set his next court date for Nov. 15. Announcing the charges in a news conference Wednesday, acting U.S. Attorney Joon H. Kim said, "Alleged terrorists like Saipov view this city as a prime target for their hate-filled crimes. The thing is, for the alleged terrorists like Saipov, they will find in New York City something else: justice." "They will find, and have found, that law enforcement and everyday people in this city are not afraid of their evil. They see through their false hateful rhetoric and are committed to bringing them to justice. And that is what we intend to do with Sayfullo Saipov," said Kim. In terms of casualties, the truck rampage was the worst terror attack in New York City since Sept. 11, 2001, authorities said. Saipov was set to head to jail after court Wednesday night, not back to the hospital. His public defender, David Patton, said that he was in "significant pain," however, and asked that Saipov be prescribed medication for the gunshot wound he sustained as he ran in traffic with a pellet gun and paintball gun. "How we treat Mr. Saipov in this judicial process says a lot more about us than him," Patton said after the hearing. Saipov told the FBI in his interviews that he planned the attack for a year and had decided to carry it out on Halloween; investigators told them he picked the day because he knew the streets would be crowded. 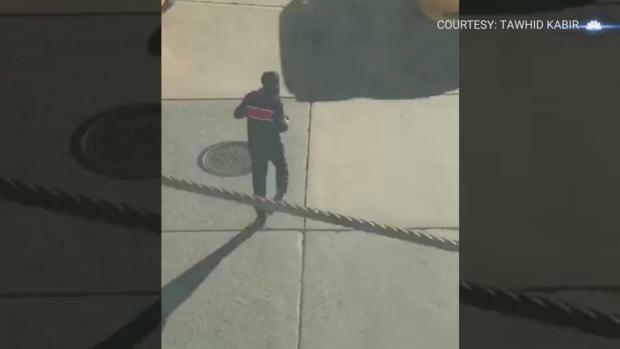 According to the complaint, he intended to drive a rented truck and strike pedestrians in the area of the West Side Highway, then proceed to the Brooklyn Bridge, where he'd continue to hit pedestrians. He allegedly said he wanted to kill as many people as he could. Saipov also wanted to display ISIS flags in the front and back of the truck during the attack but decided against it because he did not want to draw attention, according to the complaint. He waived his Miranda rights after he was arrested, and told law enforcement during questioning that he felt good about what he'd done. Officials said he asked for an ISIS flag to be displayed in the hospital room where he was taken after he was shot in the abdomen by a police officer. Saipov allegedly said he was inspired to carry out the truck attack by ISIS videos he watched on his cellphone. The FBI said they searched his phones and found approximately 90 videos with ISIS propaganda, and 3,800 images that appeared to be ISIS propaganda. He allegedly told investigators he began planning the attack in the U.S. approximately two months ago. The complaint also says Saipov rented a truck on Oct. 22 so he could practice making turns with the truck in advance of his attack. The federal complaint corroborates what NYPD Deputy Commissioner of Intelligence and Counterterrorism John Miller said at a news briefing earlier Wednesday: that Saipov appeared to have been planning the attack for a number of weeks. "He appears to have followed almost exactly to a T these instructions that ISIS has put out on its social media channels before with instructions to their followers on how to carry out such an attack," said Miller. Saipov, an immigrant from Uzbekistan, actively read ISIS propaganda, a review of his online accounts showed. 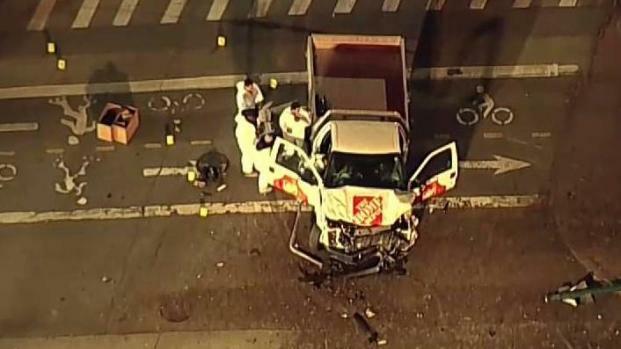 He left a note in the damaged Home Depot truck he had rented that translates to "ISIS endures forever," though at this point, investigators consider the rampage to be a "lone wolf" attack. Multiple knives were also recovered in and around the vehicle, along with a paintball gun and a pellet gun. Saipov was familiar with the area of the attack, investigators say. A senior official tells News 4 that Saipov made multiple drives to the West Side Highway near the World Trade Center in recent weeks. The travels were "inconsistent with his employment as an Uber driver," suggesting that the trips were efforts of reconnaissance and planning. Hundreds of detectives have been scouring the West Side Highway since Tuesday, going up and down both sides of the street, "meticulously trying to pick up every piece of video from every security camera, every traffic camera, every bank camera, anything that will help us put together this timeline so we can reconstruct a much as possible," Miller said. The highway will remain shut down south of 14th Street through at least Wednesday evening. Detectives are also reviewing license plate readers to reconstruct Saipov's movements in the days leading up to the attack. A number of search warrants were already executed overnight, and more witnesses may be interviewed. Police and the FBI urged members of the public to give them any photos or video that could help by uploading them at fbi.gov/nyctribeca. The mayhem Tuesday set off panic in the neighborhood and left the pavement strewn with mangled bicycles and bodies that were soon covered with sheets. 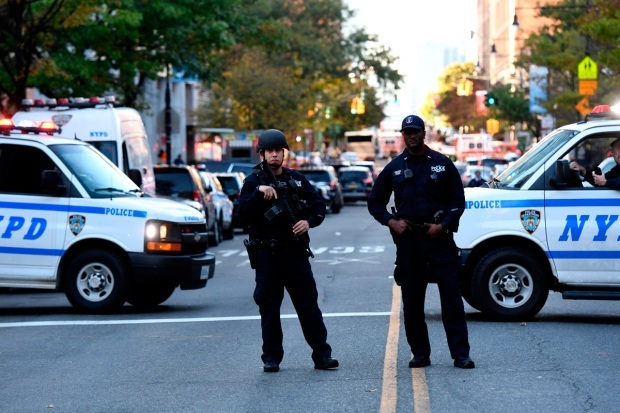 Eight people were killed and a dozen injured in a Halloween afternoon attack that Mayor de Blasio called "a particularly cowardly act of terror." While police didn't specifically blame any group for the strike, Trump railed against the Islamic State and declared "enough!" and "NOT IN THE U.S.A.!" Investigators say Saipov came to the United States legally in 2010 through a diversity visa lottery program. He has a Florida driver's license but may have been staying in New Jersey off and on, they said. Law enforcement cordoned off an apartment building in nearby Paterson on Wednesday as well. Officers searched a garage. The building's manager told The Record he lived with his wife and two children in a two-bedroom apartment on Genessee Avenue. An official says his wife is in Paterson with authorities. Saipov was never the subject of an investigation by the NYPD Intelligence Bureau or by the FBI -- but it appears he's been connected to other people who have been investigated by the NYPD or FBI, according to Miller. "We're looking for how he has touched the subjects of other investigations, what his connectivity is to those people," said Miller. "We're kind of building out in concentric circles to try and document that." Another law enforcement official tells NBC News that Saipov was interviewed in 2015 by an agent from Homeland Security Investigations (which is part of ICE, which is part of Department of Homeland Security) because he was listed as a point of contact by two other men that HSI was investigating at the time for overstaying their tourist visas. This was done while the agent was part of a Joint Terrorism Task Force in New York, the official told NBC News. Records show Saipov was a commercial truck driver who formed a pair of businesses in Ohio. 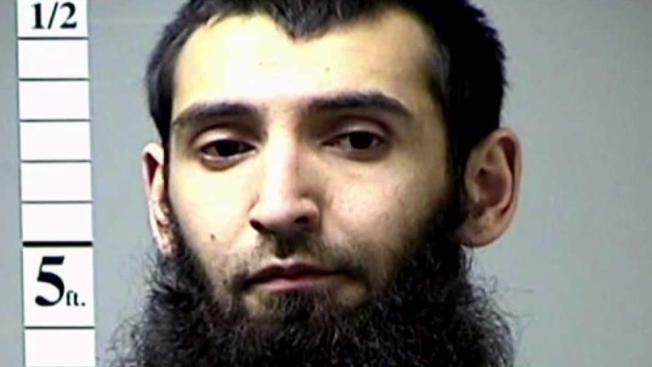 An Ohio marriage license shows that a truck driver with one of Saipov's addresses and his name, spelled slightly differently, married a fellow Uzbek in 2013. Uber said Saipov had passed a background test to drive for the service while he was living in New Jersey, and that he had been banned from accessing the app after Tuesday's attack. The company added that it is reviewing Saipov's history with the service and cooperating with the FBI. Lyft said it is also cooperating with law enforcement. Saipov pleaded guilty to two traffic offenses in Pennsylvania between 2012 and 2015, according to records from the Keystone State. He was also arrested for failing to appear in court after getting another traffic citation in Missouri in 2015; he later paid a fine and served no jail time. It's not clear if he had any other criminal history beyond the traffic offenses. Police have said the attacker rented the truck at about 2 p.m. at a New Jersey Home Depot and then went into New York City over the George Washington Bridge, entering the bike path about an hour later and speeding toward the World Trade Center, the site of the deadliest terror attack in U.S. history. He barreled along the bike path in the truck for the equivalent of about 14 blocks, or around eight-tenths of a mile, before deliberately slamming into a small yellow school bus near Stuyvesant High School and P.S. 89, injuring two staff members and two children. "A person hopped out of the car with two guns and started yelling and screaming," said a 12-year-old student who had just left a nearby school. "They were yelling 'Allahu Akbar.'" The student, whose mother asked that his name be withheld, said he ran back into the school, where students cried and huddled in a corner. Video shot by bystanders showed Saipov walking through traffic wielding what looked like two handguns, but which police later said were a paintball gun and a pellet gun. A police officer shot Saipov when he wouldn't drop the weapons, police said.